The house is one of the most common architectural typologies and has been reinvented over and over throughout history. Whether they are adaptations of the local vernacular to protect against a harsh climate, or experimental, quick-to-be-demolished single-family homes found across Japan, houses have always been fertile playgrounds for architects, status symbols, design objects, dwellings, and hurdles for urban planners. From now until November 9, the Princeton University School of Architecture will host 44 Low-Resolution Houses, a public exhibition in the North Gallery that attempts to quantify what makes a house a house. 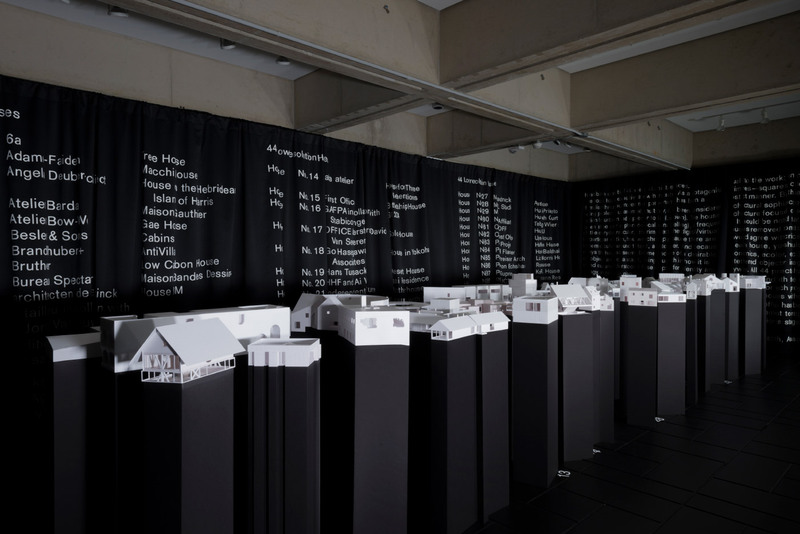 The show brings together 44 different architecture studios, each of them contributing a unique model of a “low-resolution” home. These houses reduce homes to the common elements that can be found throughout vastly different structures such as pitched roofs and typical massings, though some are scaled back to simple geometric shapes. All of the houses were removed from any context and materiality and were oriented north to enable an objective comparison between each model. Each home is treated as an individual object, to be evaluated solely on form, and many resemble existing or theoretical projects (keep your eyes peeled for a triangular model of WORKac’s take on the Earthship). All of the models have been elevated and appear to “float” against a black curtain bearing the name of the architects responsible. 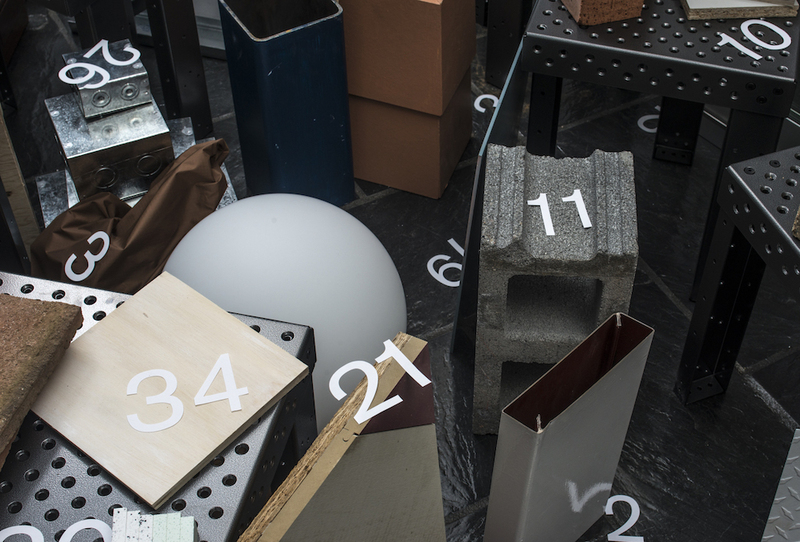 As part of the prompt, each team contributed a construction element, material, or product that would best represent their home at full scale. 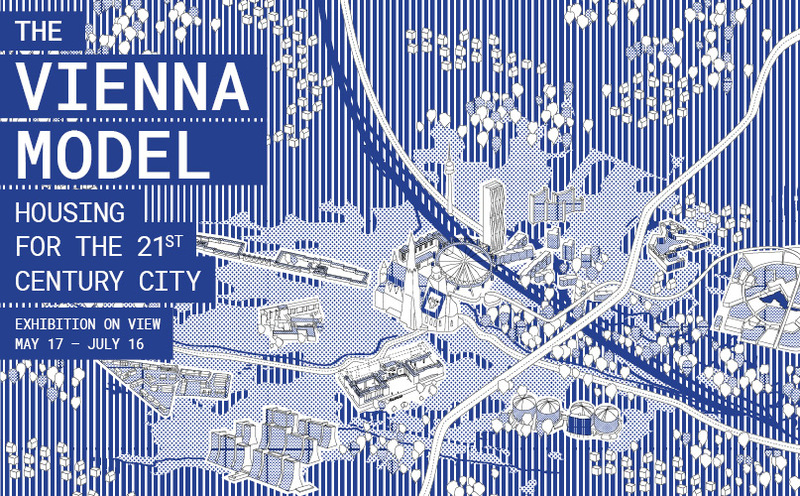 The full list of contributing offices is as follows: “6a, Adamo-Faiden, Angela Deuber Architect, Atelier Barda, Atelier Bow-Wow, Besler & Sons, Brandlhuber+, Bruther, Bureau Spectacular, architecten de vylder vinck taillieu in collaboration with Joris Van Huychem, Edition Office, Ensamble Studio, Fake Industries Architectural Agonism in collaboration with Aixopluc, fala atelier, First Office, GAFPA in collaboration with Stabico Ingenieurs, OFFICE Kersten Geers David Van Severen, Go Hasegawa and Associates, Hans Tursack, HHF and Ai Weiwei, Independent Architecture, Johannes Norlander Arkitektur, Johnston Marklee, The LADG, Lütjens Padmanabhan Architekten, MAIO, Monadnock, MPdL Studio, MOS, New Affiliates, OFF-OFF, Outpost Office, PARA Project, Pascal Flammer, Paul Preissner Architects, Pezo von Ellrichshausen, Point Supreme, PRODUCTORA, Stan Allen Architect, Tatiana Bilbao Estudio, Tato Architects, T+E+A+M, Tham & Videgård Arkitekter, and WORKac.” The show was curated by associate professor of the Princeton University School of Architecture, Michael Meredith. MOS designed the exhibition space and Studio Lin contributed the graphic design. The fashion elements were designed by the New York-based Slow and Steady Wins the Race. Cement company Lehigh Hanson is converting a defunct gravel mine into an 1,800-unit, millennial-focused mixed-use and residential community. The development, called 3roots San Diego, will be located in northern San Diego County. If built, the project would be constructed over what remains of the Carroll Canyon mine, a concrete aggregate and gravel mine that ceased operations in 2016. The development, according to Brian Meyers, a consultant for Lehigh Hanson, represents an “alternative” to prototypical urban environments for millennial individuals looking to start a family. Meyers told the San Diego Union Tribune that the development aims to provide some of the “urban lifestyle amenities” like walkability and density of use that make traditional urban areas desirable, but will do so in a more family-oriented environment. The barren 412-acre site is sandwiched between a series of suburban-style residential communities, other mining operations, and an industrial district. 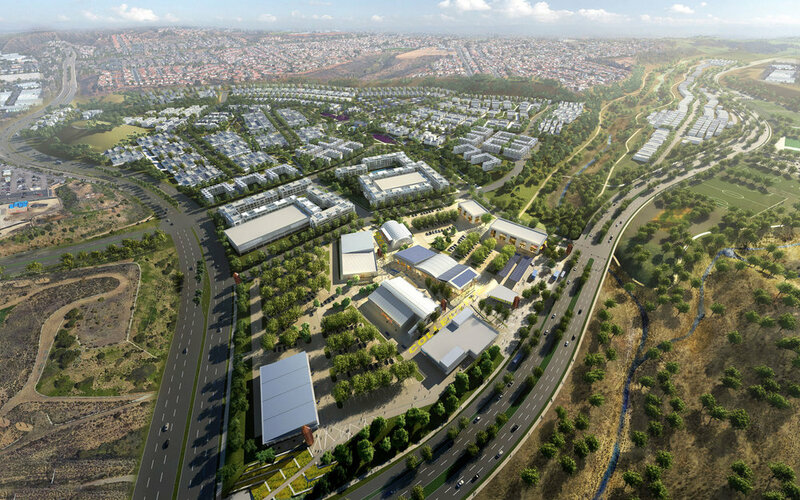 3roots San Diego aims to convert the site into an interlocking network of mixed-use and residential areas bisected by parkland and hiking trails. The project was originally envisioned in 1994 to include a 50-acre industrial district, but a recently-updated plan has scrapped that component in favor of more park space. The development is to be laid out with a mixed-use "innovation district" at its core that will maintain transit connections to a forthcoming extension of San Diego’s light rail system. The so-called Village Core area will feature 749 apartments, 120,000 square feet of retail spaces, and 20,000 square feet of creative office. Renderings for the project depict two parallel rows of warehouse-style structures surrounding a generous pedestrian courtyard. Other scattered mixed-use buildings will fill out the remainder of development’s main node with apartments, and the developer will gradually add attached and detached single family homes up and down the hilly site. A series of parks will wrap the site's edges to allow for connections to existing and new public streets and trails. Overall, 3roots San Diego will have 201 acres of open space overall, including 40 acres of publicly-accessible parks and hiking trails. Residential areas for the project will be laid out according to density, with the project’s 310 attached single-family homes sandwiched between the more dense Village Core and a zone containing 746 detached single-family homes. Renderings depict manicured rows of apartments, townhouses, and detached homes amid lush, hilly landscapes. Public meetings and and environmental reviews for the project are scheduled to completed in 2018. The developers aim to complete the first homes for the project in 2021 with final buildout by 2025. See the 3roots San Diego site for more information. The nationwide affordable housing crisis is nearing a record high: More than 8 million renters in 2015 had "worst case housing needs," according to a report released last week by the Department of Housing and Urban Development (HUD). Very low-income, unassisted families who pay more than half their monthly income for rent and/or live in severely substandard housing are labeled as worst case needs residents. The Worst Case Housing Needs: 2017 Report to Congress reveals that in 2015, 8.3 million households had worst case needs, a 66 percent spike since 2001 and a number approaching the record high of 8.48 million in 2011. Most of the nation’s very low-income renters—those who earn less than 50 percent of Area Median Income—reside in the South (6.7 million), followed by the West (4.5 million). 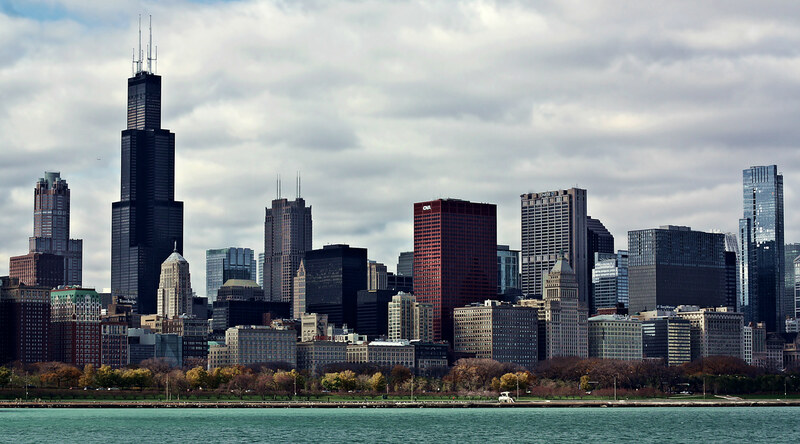 The areas with the highest concentrations of worst case households among very low-income renters, however, were in major urban areas: the New York metropolitan area, the Los Angeles metropolitan area, and the Chicago metropolitan area. HUD's report revealed that while ongoing economic recovery will help increase incomes for very low-income renters, other factors continue to drive the affordable housing crisis. The report cites severe rent burden—those paying more than 50 percent of their income towards monthly rent—as one of the primary factors. Out of the households with worst case needs in 2015, 98.2% had severe rent burden. The other main cause includes a scarcity of units with affordable rents. Despite an increase in overall rental units and in median renter’s income over the past two years, monthly rents also increased and the shortage of affordable and available units for this population became more severe. For the poorest renters, rent hikes outpace income increases, according to the report. Nationwide, only 66 affordable units exist for every 100 extremely low-income renters, and of that, only 38 are available for occupancy. The David and Gladys Wright House in Phoenix, Arizona, designed by Frank Lloyd Wright (whose 150th would-be birthday was last week), has been donated to the Frank Lloyd Wright School of Architecture. The house led a charmed life up until recently. 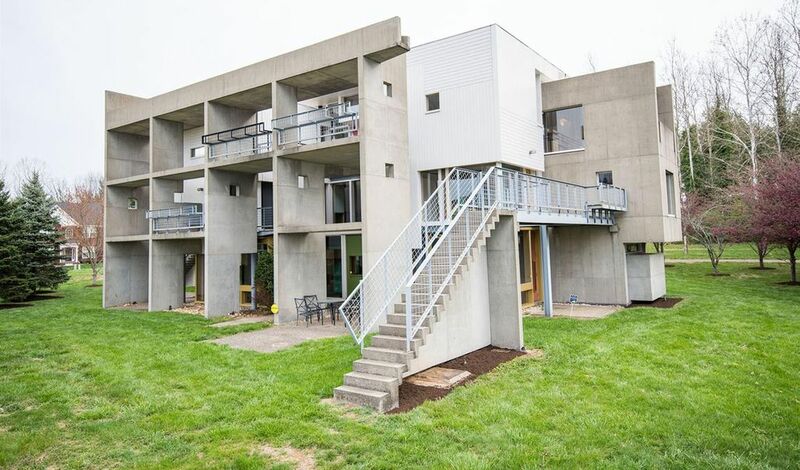 Designed in 1952 by Wright for his son David, the 2,500-square-foot, mostly concrete house had come into the ownership of developers who wanted to bulldoze it and replace it with more profitable housing. News of this intention saw preservationists spring into action, but the standard procedures were scuppered as in Arizona, where private property laws hold strong, landmarking only saves a building for three years. On October 12, 2012, Michael Kimmelman of the New York Times explained the other, costlier method of saving the house: "The other prong of attack is to find some preservation-minded angel with deep pockets who will buy it from the developer. Preferably today." Cue Zach Rawlings. A custom homebuilding entrepreneur, Rawlings fell in love with architecture after exploring it across the country with his mother. As a young boy, he even caught a glimpse of the David and Gladys Wright house when he peered over the wall. Little did he know he would later save it. During his research, Rawlings came across architects John Lautner and Wallace Cunningham, both graduates of the Frank Lloyd Wright School of Architecture at Taliesin, in Wisconsin. Cunningham went on to work with Rawlings. "The first chance I got to call and hire architects while building homes, I called Wallace Cunningham," the developer said. Then one evening over dinner, Cunningham informed Rawlings about an Act of Demolition permit that had been filed for the David and Gladys Wright home. "I finished the dinner, got on the phone with my mom and told her I was flying to Phoenix in the morning,” said Rawlings, reacting to the news. "I asked her to please call the broker of the home and schedule a tour as soon as possible." Twenty-four hours after Cunningham and Rawlings had sat down, Frank Lloyd Wright's work had been saved from the wrecking ball. After that dramatic episode, Rawlings went on to meet Aaron Betsky, dean of the Frank Lloyd Wright School of Architecture at Taliesin in 2015. Over more food (this time lunch), Rawlings became inspired by Betsky's ambitions for the school, and the pair discussed the possibility of faculty members living there. Now the house will be donated to a fund under the Arizona Community Foundation for the sole benefit of the School. "It’s transformative for the school and a fantastic opportunity," Betsky told The Architect's Newspaper. "One of the things that sets our school apart is living and working in Frank Lloyd Wright's built works—this addition only enhances that experience and lets us build on Wright’s legacy." Betsky also acknowledged that "without doubt," some work has to be done on the house before educational programming can start there. A structural analysis has been carried out, though repairs to cantilevers and fixing leaks and touching up areas of corrosion also need to take place. Phoenix-based architect Victor Sidy is working on the building, as is landscape architect Chris Winters. "This is all about the house becoming a place that can help students understand the relationship between the landscape and the built environment," remarked Betsky. He estimated that renovation work could take two-three years but admitted this was "optimistic." "We do not want to interrupt the [design] work going on inside," he said. Once restored there will be limited tours, and the house will be open to the public. California—and the San Francisco Bay Area, in particular—is currently suffering from a prolonged and devastating housing affordability crisis. Housing construction over the last decade has been anemic, relative to previous decades, at a time when the state’s population and economy are both booming. The San Francisco Housing Alliance Coalition (SFHAC) formed back in 1999 during the first dot-com boom to advocate for inclusive housing policies for the city of San Francisco and has played a significant role as an advocacy group across the region in the decades since. In advance of the organization’s Spring Symposium, The Architect’s Newspaper (AN) spoke with Rob Poole, Development and Communications Manager at SFHAC, to discuss the organization’s recent initiatives, goals and the group’s efforts to help address the housing crisis. For more information on the Spring Symposium, see the SFHAC website. AN: Can you explain a bit about SFHAC’s short-term housing goals for the region? What are a few of the projects or initiatives you are working on getting approved over the next few months or years? Rob Poole: I’ll break this up into short-term versus long-term goals, and local versus regional. At the present moment in San Francisco, we’re in the final stages of passing a program called HOME-SF, the city’s first major tool targeted at creating homes for San Francisco’s middle-class, which has been underserved by the city’s housing policies. Under HOME-SF, developers who build in certain parts of the city (primarily outside of area plans and RH-1 neighborhoods), would have the option to build denser buildings and add two extra stories in exchange for providing a higher percentage of subsidized housing targeted at moderate-and middle-income residents. This program has been in the works for about three years and should finally get passed this month. In addition, the city is about to adopt a new inclusionary ordinance, once again. The most recent requirement was decided upon by the voters and was—frankly—an arbitrary number, 25%. We’re pushing for a data-drive policy, which I’ll touch on later. Both of these measures have taken up a lot of our time. For the more long-term, we consistently search for ways to improve the process for creating housing in San Francisco. The city is known for having an enormously complex and lengthy approval process. We’d like to see more certainty and remove some of the risk for building in a place with a chronic housing shortage. Accessory dwelling units (ADUs), also know as “in-law” homes, are another priority. A couple of state bills were passed last year—AB 2299 and SB 1069—that remove some of the costs for building or home owners to add these. We want to ensure San Francisco is in compliance with the new laws. Stepping outside of our sandbox, SFHAC staff has regularly attended and organized residents to speak at Brisbane City Council hearings in regards to a project called Brisbane Baylands, which borders the southern part of San Francisco. The developer has plans to build a mixed-use project with over 4,400 homes, but the City has pushed for a plan with zero housing because that’s what the most vocal residents down there want. That’s frankly unacceptable and emblematic of the struggles the region faces around local governance. The site is essentially 680 acres of dirt and is adjacent to a Caltrain station. What happens there impacts the entire region as much as it does Brisbane, yet the City Council only has to listen to their voters in a town of about 4,200 people. We’re trying to influence the outcome by showing the City Council their decisions have impacts that extend far beyond their town’s borders. Finally, the conversation around has housing has picked up a lot in Sacramento, which influenced the theme of our Spring Symposium on May 23rd. There are over 130 bills pending in the legislature that address how homes are funded, planned for and approved. SFHAC has taken positions on several of these measures, including SB 35, AB 71, AB 73, AB 915 and SB 167 and AB 678. We give our members the opportunity to weigh in on these bills and stay informed as they work their way through the approval process. We should know what happens with all these by the fall. This is new territory for SFHAC, but it’s likely to only grow in relevance. We cannot expect to solve this problem by allowing cities and suburbs to make land-use decisions independently of one another. Are there target neighborhoods or corridors your organization is seeking to specifically add housing to? Housing should be located where those residents are more likely to walk, bike and take transit to get around. Our land-use decisions must reduce vehicle-miles-traveled (VMT) via private automobile use. Otherwise, we will not achieve our environmental goals at the local, regional or state levels. That mindset drives our advocacy. This also falls into an issue we like to call “density equity.” In San Francisco, about 80 percent of the development happens on 20 percent of the land. Most new housing gets built along the eastern and southeastern half of the city while the west side hardly adds any homes. There are a couple reasons for that. Over the past 20 years, the city has spent a lot of effort rezoning neighborhoods, via the Better Neighborhoods Plan, where the land historically had industrial use or been underutilized. As the economy changed, many of the uses became less relevant and it made sense to rezone them for housing. This has primarily been done along the eastern side of the city. The west side is a different story. These neighborhoods are primarily zoned for single-family homes, except along some the transit and commercial corridors. Historically, there’s been a lot of opposition to any kind of change towards the built environment, which makes it difficult to build housing there. SFHAC believes these neighborhoods need to step up and provide their fair share of homes. We acknowledge it doesn’t make sense to build towers out there because the transit isn’t as sufficient, but it’s not fair nor good planning to allow one side of the city to stay frozen in time while the other half takes on all the new housing. HOME-SF will help move the needle. At the regional level, there are so many municipalities that simply don’t contribute. Brisbane is just one example. But there are numerous cases where organized opposition will use every tool at their disposal, be it California Environmental Quality Act (CEQA) appeals, lawsuits or just turning out people to public hearings, to influence outcomes. As a result, housing is built further away from jobs where there are less people to oppose it. The recent report from the California Department of Finance reaffirms this trend. There aren’t any incentives or penalties for cities that don’t do their part. Some of the state bills, such as SB 35, would change this. 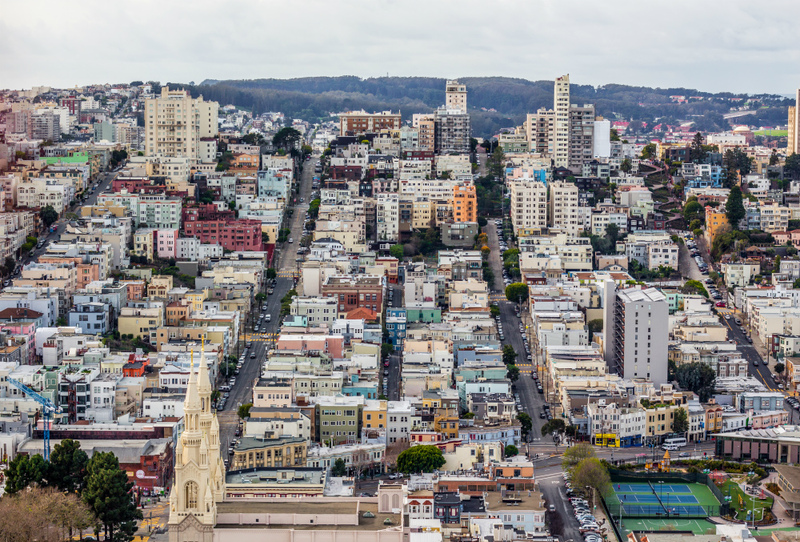 There’s been lots of talk lately regarding inclusionary zoning requirements—current requirements are too high, don’t go far enough; inclusionary zoning actually dampens market-rate housing production—what is SFHAC’s position on inclusionary zoning? Inclusionary housing is a smart tool to provide homes for low-income residents, especially in expensive markets. SFHAC was at the table in 2002 with then-Supervisor Mark Leno when we crafted San Francisco’s first mandatory inclusionary ordinance. Since then, the program has resulted in over 4,600 below-market-rate homes (BMR), for both rental and ownership. 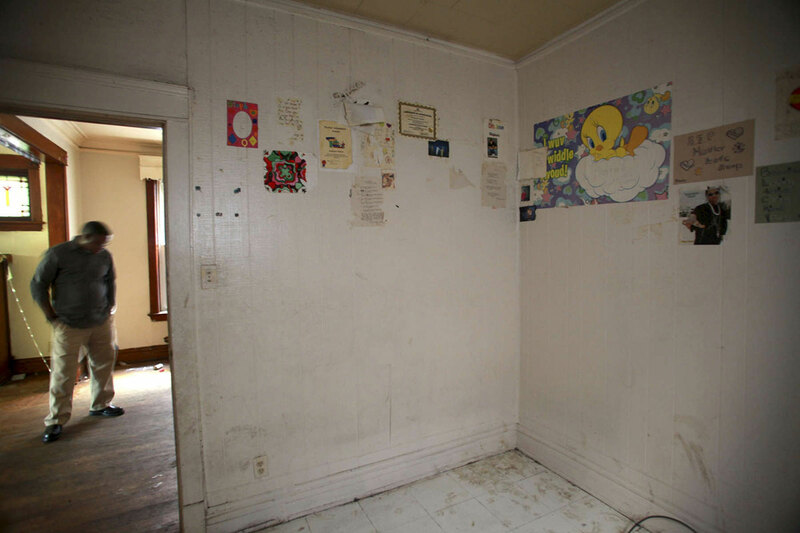 Those are homes for people who otherwise may have been priced out of the city. On the flip side, that doesn’t come remotely close to meeting the need. For example, there was a recent project along Market Street that had 144 applicants for every one BMR. Some think the solution is to make the requirement higher, based on the idea that developers make so much money and market-rate homes will never be affordable to anyone besides the rich. We reject that notion. Inclusionary zoning policies should be data-driven so they do not restrict supply of market-rate housing, because that is tomorrow’s middle-class housing. Last June, San Francisco voters passed a measure that more than doubled the inclusionary requirements, from 12 to 25-percent on-site. There was no study to support whether this was financially feasible. Since then, applications for new projects have dropped significantly. So what will probably happen in the long run is we’ll see less homes get built than may have had we not changed the requirement, which will drive up the price of market-rate homes. That’s scary to imagine considering how expensive it is already. Keep in mind, the subsidy that makes BMRs affordable comes from the rents of the market-rate units. That means if the requirement is set too high, only the most luxurious projects are likely to get built, because those are the ones that pencil out. It’s the smaller projects and the developers with less money that get cut out from the process. As a result, we remove any possibility of building naturally affordable housing (a concept known as “filtering”). To put an end to my long-winded answer…I want to reiterate that SFHAC supports inclusionary zoning. It is one tool in the toolbox. But cities should not rely on it as the end-all, be-all solution for housing. It does not scale to the severity of the problem. And unless Congress decides to quintuple the Department of Housing and Urban Development’s budget, we will not be able to subsidize our way of the problem. Planners, politicians, developers and architects will have to accept that they’ll need to get much more creative with how they approach housing in the open market. I know that’s not the most popular idea politically, but I don’t see how else we can change course given the lack of support from the federal and state government. Do you have anything else to add? Yes. I think we’re at the beginning stages of a new era in regards to how the general public perceives this issue, at least in the more urban parts of California. People are starting to understand that the status quo does not work. Now, instead of the loud Not-In-My-Backyard (NIMBY) voice that local elected officials are used to hearing, they’re listening to the Yes-In-My-Backyard (YIMBY) voices. This is a political movement. We’re starting from a tough place, however. The policies we’ve adopted over the past several decades promote sprawl, aren’t friendly to newcomers and still result in economic and racial exclusion. This will not change unless there are organized, thoughtful and influential groups working to shift the tide. At SFHAC, we bring all the parties together—the private sector, city staff, politicians, YIMBYs and even those who don’t agree with us (at least if we’re able to)—to form pro-housing solutions that result in choices for people of all income levels. It took many years to get us into this hole we’re in today and it will take a long time to climb our way out. But given some of the recent decisions that have been made here in San Francisco and even at the ballot in Los Angeles, as well as the political energy in Sacramento, I think we’re on our way there. 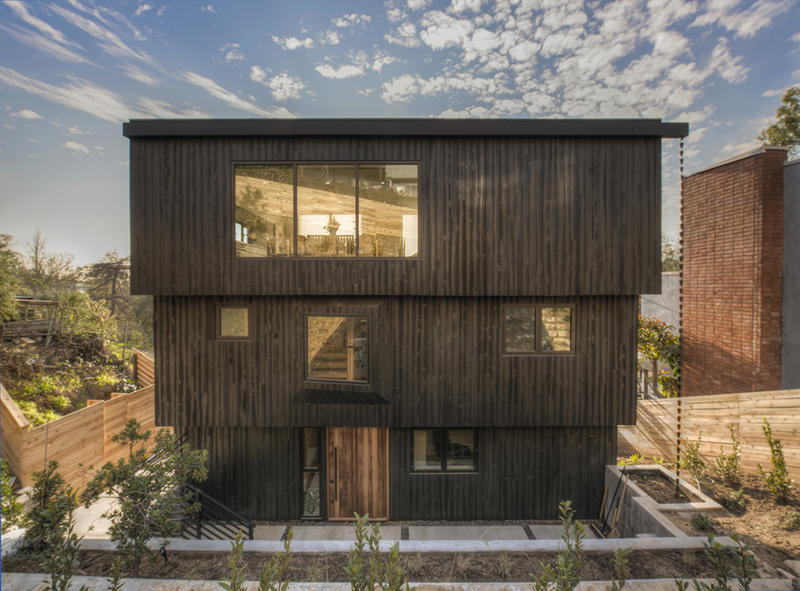 The Los Angeles Design Group (LADG) recently completed work on their Armstrong Residence, a 1,894-square-foot renovation of an existing, split-level single family house in Los Angeles’s Silverlake neighborhood. The house's massing is directly inspired by Marcel Breuer’s former Whitney Museum in New York City, except that instead of jutting out over a busy Manhattan street, the Armstrong House instead steps out along its back facade, mimicking the slope of a gentle hill located behind the house. Along the street front, an inset-bay window—Breuer’s streetside eye juts out from the structure—interrupts the otherwise monolithic, charred cedar wood exterior. The front window is contained within an overhanging car port and its panes are torqued to align perpendicularly with the nearby Silverlake Reservoir. On the back side of the house, a projecting oculus is similarly torqued and arranged here, in parallel with the slope. Both windows are an attempt, according to the LADG principals Andrew Holder and Claus Benjamin Freyinger, to “interiorize” exterior landscape features as elements of interior scenography. Along areas where the exterior envelope is broken, like along the lids of the oculus or the planes of a stepped-back, third-floor facade, the wood siding shifts to a natural finish. The house is designed as an “upside down house,” organized with a large, clear-span living room at the top floor with two levels containing two bedrooms, bathrooms, a study, and a laundry room located below. The new top floor acts like a hat over the existing spaces. The living room organization, much like the original split-level design, maximizes the house’s viewshed toward the reservoir. The space is organized around its views, with a built-in kitchen assembly on one short end of the rectangular great room, and a relaxed seating area located opposite. The areas between these spaces are animated through the presence of a pair of operable window-walls that open onto a generous exterior terrace. The indoor-outdoor living room—its front wall pulled back from the facade and clad in naturally-finished cedar—looks out over the surrounding hillsides and reservoir. After a year-long attempt to find new stewards, Peter Eisenman’s House II in Hardwick, Vermont is reaching the zero hour. Devin Colman, the Architectural Historian for the State of Vermont, contacted Docomomo US this week stating, "the owner is willing to sell the house and 15 acres for $425,000 to anyone who will save the house. If it doesn’t sell, he has a buyer ready to purchase it for the land only, demolish House II, and build a new home on the site. The buyer wants to close by the end of June so he can start demolition this summer. Only the price in the title has been amended. The article otherwise appears as it did on April 24. Have you always dreamed of living in the cozy hills of Vermont? Do 80 acres of organic farmland and a pond sound just lovely? How about windows in your bedroom overlooking the beautiful mountains and the neighboring rooms? If this sounds like the life for you, look no further than American architect Peter Eisenman’s experimental ‘House II,’ which has just hit the market for $850,000. ‘House II’ is the second of ten experimental houses designed by Eisenman, and one of only four that were ever built. The project was built in 1969 and the listing hails it as a “mid-century modern” home. Potential buyers should be warned, however, Eisenman’s version of modernism in 'House II' relates more to Noam Chomsky's linguistic structuralism than to the Case-Study Houses and Palm Springs aesthetic that are usually associated with the phrase ‘mid-century modern.’ Eisenman’s experimental houses were known for, well, being very experimental and challenging conventional ways of living. When designing 'House II' Eisenman aimed to create something ambiguous, resembling both an architectural model, an object that dwells in an enigmatic world often lacking scale and materiality, and a home, something physical and, in most cases, functional. In order to accomplish this, Eisenman designed a series of volumes and planes around a square, three-by-three grid. The end result is a home that feels more like an inhabitable sculpture than a traditional house. Since its completion, the home has gotten a new roof (something about flat roofs and Vermont snow causing leaks) and a complete renovation to bring it back to its original semi-livable glory. If all the above facts still do not deter you, you can visit the home’s listing on Zillow here. Don’t say I didn’t warn you.